The Justice of Toren faithfully served the Radch, a galaxy-spanning empire overseen by Anaander Mianaai, the multibodied, immortal The Lord of the Radch. The empire has stood for millennia, maintained by a militaristic system of ships, human soldiers and undead ancillary soldiers under the control of their ship. The ships, such as the Justice of Toren, are run by advanced AI systems who oversee all parts of their command and mission. With the opening of Ann Leckie's debut novel Ancillary Justice, we're introduced to Breq, the last individual of the Justice of Toren, whose twenty year mission is almost at an end. Epic in scale, but intensely character-driven, Ancillary Justice never gets lost in the minutia of world building details that so often befalls most space operas: Leckie is focused and precise with her story and characters, putting them through their deliberate paces as the story advances. The story unfolds in two narratives: one in the present, the other in the recent past. Breq has arrived on a cold, distant world, where she rescues Seivarden Vendaai, a soldier in her service over two thousand years ago, from certain death. She's on a mission to acquire a weapon that will help her kill Anaander Mianaai. The reasons behind her mission unfold with a flashback narrative that runs about twenty years before the present day, as she and her ancillaries are over the planet Ors, where one of her lieutenants comes across a vast conspiracy that could rock the foundations of Radchaai society. Breq's very nature is a unique voice, and an interesting choice for this novel. She's everywhere, and the first chapter when we see her in her former glory is a fantastic scene that flows from each of her decks down to the planet's surface, showing just how powerful she is as a tool, and just how resiliant she is as a character. When she's on her own, Leckie gives the distinct sense that Breq is incomplete, formidable as she is as the last Esk from the Justice of Toren. One of the delights of this novel is the complete flip of gender roles in this novel. Space opera is historically a very male-oriented sort of fiction, and about halfway through this book, I realized that I couldn't pull out a single male character that had been named, or even mentioned. It's an odd change, but that seems to be the intention: changing up a reader's expectations helps make this a more interesting and enjoyable read, because it left me with fewer character memes to work with as I read. Throughout the novel, Leckie is a master with her characters, something made more difficult when they span multiple bodies and at times, with competing factions within one's self. Leckie pulls the reader along in excellent form, folding in a nice range of interesting characters and their actions. It's a task made less easy when parts of the story sit twenty (and even a thousand!) years apart, but the end result comes together at the end in satisfying and unexpected ways. The story begins as a sort of quest, and evolves into one of the more politically astute adventures that I can think of that's come in recent years. Elements such as societal change become readily apparent as we come towards the end, providing a very real sense of allegory that's all too relevant in this day and age. 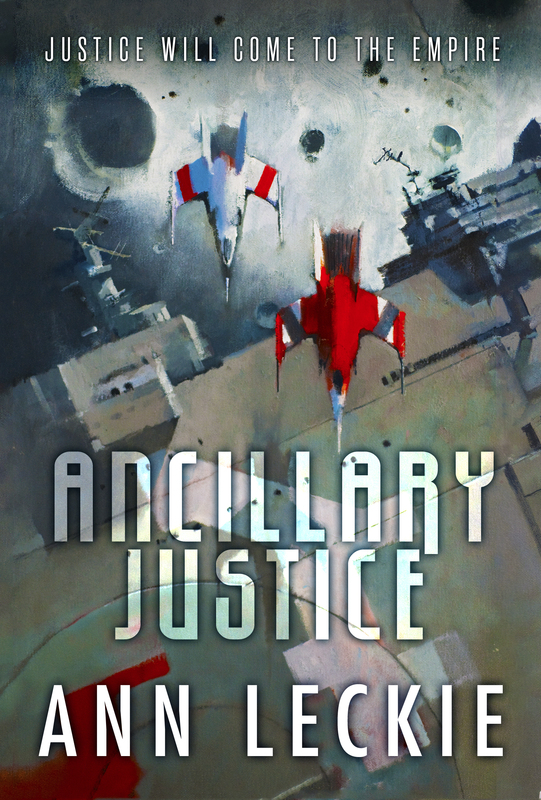 Topped with a fantastic cover by John Harris, Ancillary Justice is easily one of the best books that I've read thus far this year (in a year crowded with excellent books! ), and it's one of the best first novels of this new decade. Already well known for her work as a short story author and editor, Leckie is now a novelist to keep a close eye on.